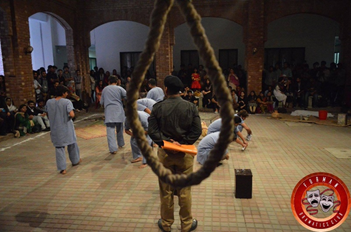 Justice Project Pakistan, Ajoka Theatre Pakistan, Complicite, Highlight Arts in collaboration with Forman Dramatics Club present ‘Intezar’ – an interactive theatre experience that gives you the chance to be a part of the story of Pakistan’s most vulnerable prisoners. We walk you through the stories of real prisoners, some of whom were executed after Pakistan resumed executions in Dec. 2014. While their stories may have been buried with them, this new piece of open-source verbatim theatre will bring them alive. 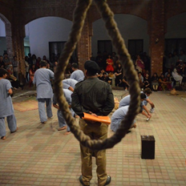 Speak to Aftab Bahadur, executed for a murder he didn’t commit. Talk to Khizar, so mentally ill he does not even realize he is in prison. Ask Kanizan Bibi to tell you about the torture she was subjected to. Find out how long they have all waited in prisons only to die waiting for justice. The lines between punishment, cruelty, justice and mercy are blurred when there is a life on the line.